I think it's fair to say Tia Torres, founder and head of Villalobos Rescue Center, has lived a varied and interesting life. She has, especially, known a lot of wonderful, challenging, and interesting dogs. She tells her story organized around those dogs--Cougar, Duke, Moose, Lucky, and others, in California and in Louisiana. The rescue started as a wolf and wolf mix rescue, and the shift to pit bulls was gradual and almost accidental. Working with wolves and, as a trainer for the entertainment industry, with a variety of large and dangerous animals, she developed a confidence and an awareness of body language that helped her both to work with dogs, and to establish her reputation with the rescue community. Her more chaotic and unreliable relationships with her fellow human beings also helped to focus her attentions and efforts on dogs. Torres is a great storyteller, and in both the writing and the reading she makes her experiences compelling and absorbing. Yet she's also a very private person, and there are a lot of things I'd be interested to know more about, that she simply passes over. She respects her own privacy, and doesn't share what she doesn't want to share. Nor is she overly concerned about linear storytelling. Each of the chapters is orderly in itself, but the arrangement of them is more a flowing from theme to theme, than starting at the beginning of her story and continuing on to the present time. Sometimes this means we get two different perspectives on the same incident, how it seemed at the time, and how it seemed later, after more reflection and/or more information. 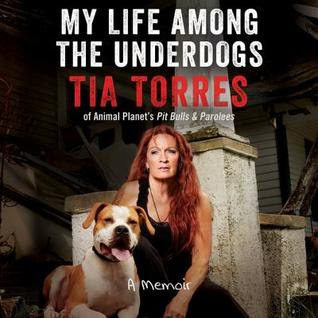 Because this is a book about Tia Torres' lifetime in animal rescue, it unavoidably involves some dogs, some dogs very important to her and to her four children, dying. There's no avoiding it in telling her story properly, but for some people, who would otherwise love the book, that will be a deal-breaker. That's unfortunate, but neither do I want to trick anyone into starting a book that they won't be able to enjoy and finish. It's an excellent book, though, and highly recommended.